MediaTek strictly follows the six core values: Integrity, Conviction Inspired by Deep Thinking, Customer Focus, Constant Renewal, Innovation and Inclusiveness. We have set up various internal guidelines to consistently keep the company on the right path and fulfilling business goals, as well as the company’s vision. Also, MediaTek fully values the importance of effective corporate governance and has established a corporate governance system in accordance to relevant Taiwanese laws. The MediaTek board delegates various responsibilities and authority to two Board Committees, Audit Committee and Remuneration Committee to supervise the company effectively. The principle of MediaTek corporate governance is to protect shareholders’ rights and enhance the functional efficiency of the Board, Audit Committee and Remuneration Committee. It is also the company’s goal to establish a comprehensive information disclosure system to fairly disclose correct and timely relevant information on its website as well as MOPs (Market Observation Post System) to ensure shareholders can access the Company’s latest information. The Chairman appointed General Counsel David Su as Board Secretary, the Legal & Intellectual Property Department under the General Counsel as the department responsible for corporate governance and business integrity, to safeguard shareholder rights and strengthen the Board’s functioning. 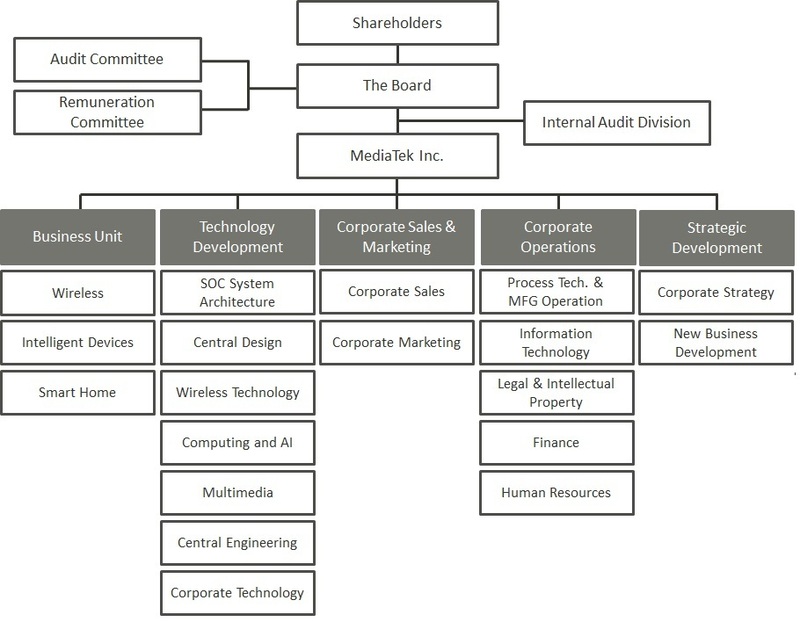 Primary duties are to provide the Board directors with information needed for executing their roles, conducting Board Meetings, Audit Committee Meetings, and Shareholder Meetings, and to assist the Board Directors with legal compliance. The General Counsel is an officer of the Company and a qualified attorney with over 3 years of experience in managing legal matters of a publically traded company.